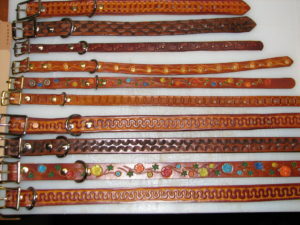 Why shouldn’t the most important 4 legged critters in your life have a custom leather collar and/or leash? Imagine the coolest matching leash and collar for your pet. Collars range from XS, S, M, L, XL, & XXL, 8″ to 38″. They can be 1/2″ to 1″&1/4″ wide. A Leash is usually 5/8″ or 3/4″ and approx 5′ in length. 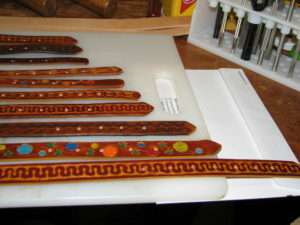 This length can vary based on the piece of leather I cut them from. 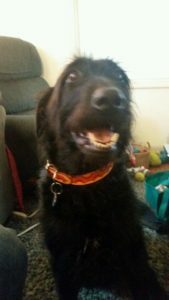 Custom designs are available and names can be added to collars. 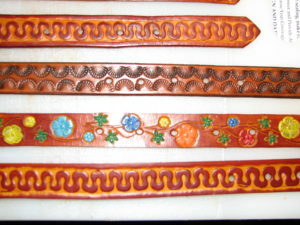 Collars come with attached D rings to attach tags, and/or leashes. For maximum comfort when your pet is walking you, I suggest a custom harness to prevent stress at the neck. 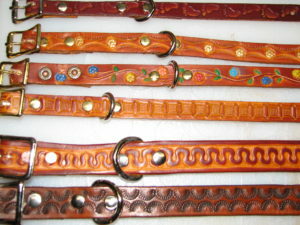 Below are some examples of collars, and remember a leash can be made to match or compliment your pet’s collar.